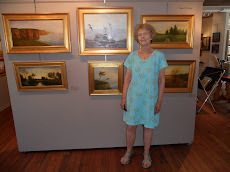 The Newmarket Creativity Center art and poetry reception was enjoyed by many people. The poetry reading was very enlightening. It was so much fun for me to hear what the poets wrote after studying my paintings. Chip Bergeron wrote a poem called "The Old Bridge" for a my painting "Bradford Bridge". The painting was sold that evening in the silent auction. Here is a picture of Chip and his poem. Concrete on stone footings much wider than the creek. Of the bridge bottom. But it always held, and holds now. That will remain uninvented for decades. What wonderful times! Do you remember fishing there, catching horn-pout and perch? That was unlucky enough to blunder down from the pond? Sometimes diving off the big boulder in the middle. Clothes on, but what mothers didn’t know never hurt them. Kept an eye out for girls, nobody minded. We felt so free! There was never a king who banqueted better in youth’s comradeship. Was freely given? Those first were far sweeter than any shared since. The mind remembers what it wants, and it still wants-fiercely. This old boy sees unhindered the life and the times that flow beneath.